Colombia’s capital, and largest city, Bogotá is in many ways a microcosm of South America. In its historic center in the district of La Candelaria you can see the restored mansions of the Spanish colonisers, while the northern areas of the city are made up of modern malls and skyscrapers, interspersed with leafy parks. The south of the city is generally less prosperous and with its small houses on steep slopes. Bogota has historically been more of a gateway to the rest of Colombia than as a destination in itself, but the city offers an often surprising amount to detain visitors itself. As well as the colonial centre, which draws most visitors to Bogota, a visit to the city’s stupendous Gold Museum is an absolute must. The Montserrate cable-car is another fantastic way to spend an afternoon in Bogota, taking you from the city up to the park at the top of Mount Montserrate, and affording some amazing views back across the city and the mountains in which it sits. Of course, as the capital, Bogota is also the natural base for exploring the rest of the country, with excellent road links and regular flights to all areas of Colombia. 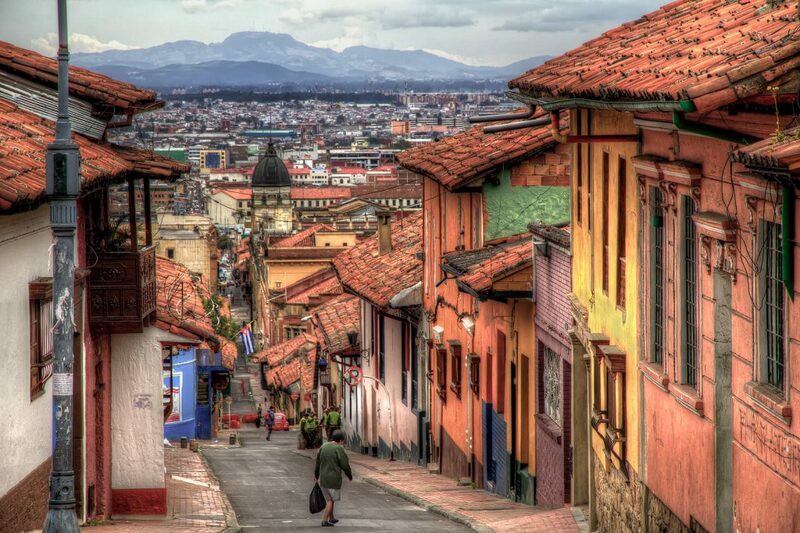 Bogota sits approximately 8,660 feet (2,640 meters) above the sea level in the Andean Highlands. Bogota has developed a rapid transit system and encourages eco-friendly modes of transport. It now boasts Latin America’s largest network of bicycle paths — 300 kilometers — and 17 kilometers of pedestrian-only streets.